If Premier League football clubs did a Radiohead and let you choose the price, how much would you pay? Today Radiohead released a new album, In Rainbows, that has no fixed price – you, the consumer, decide how much you want to pay for it. It’s a remarkable ploy, and one that only a major-league band like Radiohead could get away with, but could it work for football? Currently one can expect to pay anything between Â£25-Â£50 for a standard seat in a Premier League ground, which can seem like you’ve been massively overcharged after 90 minutes of goalless tedium. 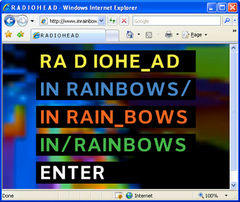 I too am listening to a free copy of In Rainbows Kipp, as I type. And it’s not bad at all. I think Â£32 including free fish ‘n chips and a large soft drink is a good price. I have a secret crush on Kipp. depends who I was watching. if its arsenal or totenham then I would pay the full price. If its chelsea or middlesbourgh then I would feel like I deserve recompense. Â£20-Â£25 for average prem, Â£15 for championship. Still be more than anywhere else in Europe wouldnt it? Just not takin the piss. Shall I buy a hat, Kipp and Stacy? Ollie don’t be going all soft on us !!! Kipp your not a football agent by any chance ? How about the clubs pay us !!! Managers and players are always saying ” it was the 12th man that won it for us tonight” Surely we should qualify for some sort of win bonus . What do the Prem charge for Chumpions league ? One Big Mac Meal for Kipp. I’d throw in a hot apple pie if he comes with a hat. Â£25 Adults, Â£12.50 for kids. This should be the fixed price for all prem clubs, seeing as most of the matchday revenue these days comes from domestic and foreign broacasting rights. Example: Last sunday’s game between Sunderland and Arsenal. Sunderland fans somehow had to make it down to north london before the lunchtime kickoff and still had to pay through the nose for an away ticket. Why is that? because the true fans come second to the new fans in the far east. and im eating it out of a hat! Who’d have thought!